At first glance it may seem odd that women once enjoyed such a high profile in the blues. 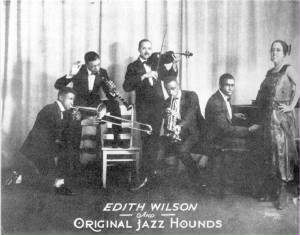 Pianists Bertha Consoulin and Lil Hardin, who worked with King Oliver, pianist Mary Lou Williams of Kansas City and the John Williams and Andy Kirk bands; and Dolly Jones, whose vaudeville act included jazz trumpet specialites, were part of a small minority of working black female instrumentalists in the 1920s. 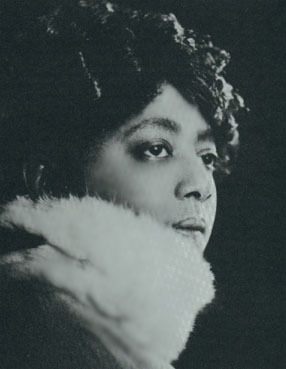 Chicagoan, Lovie Austin was better known, since her name appeared routinely on the Paramount label's blues releases between 1923 and 1926, both as a pianist and as leader of Lovie Austin's Blues Serenaders, backing up the label's stars Ida Cox and Ma Rainey, and occasionally contributing some group instrumentals on her own. emerged alongside them, providing countless opportunities for aspiring talent' The comparitively egalitarian nature of the stage gave young women the opportunity to develop their talents and earn at least a precarious livelihood with them. As the blues became profitable, singers toured the country on the T.O.B.A (Theatre Owner's Booking Association) circuit, which linked stages in small towns with those in big ones, allowing residents an occasional evening with their favourites. Given these conditions, the apperance of Mamie Smilth on records in 1920 was truly a history-making event. She was thirty-seven at the time, a veteran of years of touring as a dancer, chorus girl, and cabaret singer. Her first few records, especially "Crazy Blues" sold exceptionally well, opening the way for other talented black vaudeville ladies-Edith Wilson, Mary Stafford, Lucille Hegamin, Trixie Smith, and Ethel Waters, to name a few - to supplement their incomes with record making. Except for trips to ports of call below the border, virtually all recording in the early 1920s took place in New York, where sophisticated Harlemites (by and large) had little interest in the blues. Perry Bradford reported that W.C. 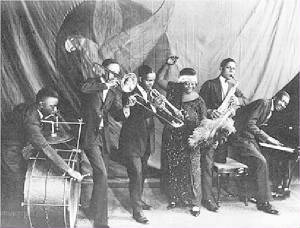 Handy's band from Memphis was scorned when they attempted to play the blues at Harlem's Lafayette Theatre in 1918. Some minds changed when early successes like "Crazy Blues", Ethel Water's "Down Home Blues". and Lucille Hegamin's "Arkansas Blues" achieved hit status on Records, still, these singers (with the very notable exception of Waters) had comparatively little success with the semiblues hybrid tunes turned out by hopeful Broadway writers and publishers throughout the 1920s with the aim of "improving" on the blues. 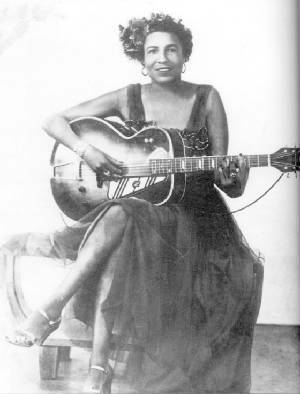 One exception to this rule was Atlanta-born Trixie Smith, whose "Trixie's Blues" merited first prize in a widely publicised blues contest and a susequest recording contract in 1922. Though she was also a veteran of the stage, her southern roots kept her close to the blues. "Freight Train Blues", "My Man Rocks Me", Railroad Blues", and "Mining Camp Blues" incorporated traditional elements into new compositions and served notice that there was a hearty appetite outside New York for non-vaudevillen blues. Though she was an excelent singer, Trixie Smith produced slight impact compared to that made by Bessie Smith, whose superbly resonant voice captured depths of emotion old to the blues but new to records when her first efforts were published in 1923. By then she had worked southern minstrel shows as well as northern theatres, becoming a seasoned singer of both pop songs and blues. Rumours persist that recording auditions were made in 1921-1922 and that she was turned down because of her earthy voice and her earthy behaviour. True or not, such stories (and there are plenty more) have helped enshrine a great singer in even greater legend. Bessie Smith early in 1923 and promptly signed her to a one-year exclusive contract, despite the fact that her first record (and her first major hit) was a cover of "Down Hearted Blues", which Alberta Hunter had written and recorded two years previously. Edison, Emerson, Black Swan, and Okeh have all be cited as companies that turned Bessie Smith down after auditions. Hindsight makes it easy to scorn their mistakes. However, the reasons for these early rejections become clearer when Smith's first records are compared with those of her contemporaries, whose thinner voices were less of a threat to disc-cutting styli and whose dialects were far less pronounced. All the more credit, then, to Frank Walker, whose judgement was quickly vindicated in the marketplace. The pairing of "Gulf Coast Blues" and "Down Hearted Blues" sold almost 800,000 copies during 1923, a figure that probably exceeded that of "Crazy Blues" three years earlier. Though her subsequent releases never outdid the first, she remained a prominent artist on the Columbia roster until the Depression. Bessie Smith's records were invariably made in New York, where optimal studio conditions prevailed and where the broad resonance of her magnificent voice could best be captured. She rarely used more than two or three musicians to back her; often she and Walker were satisfied with simple piano accompaniments, which allowed minimum distraction from her singing. Still, her best efforts usually involved larger groups, mostly drawn from Fletcher Henderson's orchestra. Cornetists Joe Smith and Louis Armstrong provided memorable second voices on the few songs they played on. ; trombonist Charlie Green was an exceptionally fine blues soloist in Henderson's band and on his numerous accompaniments for Bessie Smith, who on one occasion even paid tribute to him with the song "Trombone Cholly". Green and Joe Smith also participated in a unique 1927 session devoted exclusively to Tin Pan Alley tunes; the Bessie Smith versions of "Alexander's Ragtime Band", "After You've Gone", and "There'll Be A Hot Time In The Old Town Tonight" remains definitive and unsurpassed. Fred Longshaw were sufficient for the understated backings required. But on records these men fare poorly and are heard all too well. Smith's best records tend to be those with capable musicians who were better able to support her while providing interesting moments on their own. 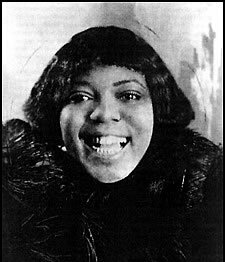 Bessie Smith succeeded in part because she masterfully straddled the line between vaudeville and the blues, drawing on rural black vocal style to enhance material that sounded perfunctory by comparison when performed by her stage-oriented contemporaries. in 1902 in a small town in Missouri where she was appearing with a show under a tent. She tells of a girl from the town who came to the tent one morning and began to sing about the "man" who left her. The song was so strange and poignant that it attracted much attention. 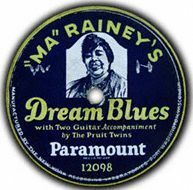 "Ma" Rainey became so interested that she learned the song from the visitor, and used it often in her "act" as an encore. The song elicited such response from the audiences that it won a special place in her "act" as an encore. Many times she was asked what kind of song it was, and one day she replied, in a moment of inspiration, "it's the Blues". This account is fascinating because it inspires at least as many questions as it answers. Rainey also told Work that she had received comments in the press about her singing of "these strange songs" as early as 1905. If her memory was accurate, she had encountered the blues even before W.C.Handy first heard it in Tutwiler, Mississippi, in 1903. Most accounts place the origin of the blues in the first years of the twentieth century. If "Ma" (the name always appeared in quotes) Rainey's account is as plausible as it seems, she served as both midwife to the new music and as an important early champion, adopting the blues as a professional singer and introducing it throughout the South and Midwest in her popular shows. It would be interesting to know what sorts of songs the blues displaced in her repertory; there is little besides blues on the records she began to make twenty years later. It would also be nice if we knew what the song was she heard on the Missouri morning, and could discover the 1905 press clips she cited to Work. With three exceptions, the female blues singers who graced early 1920s recordings were born around 1895. Mamie Smith (1883-1946), Sara Martin (1884-1955), and "Ma" Rainey (1886-1939) were well into their thirties by the time they made records. Smith and Martin provided innovative novelties their sophisticated audiences enjoyed. Rainey, by contrast, was steeped in the folk culture of her people. References to agriculture, hard times, superstitions, and, above all, loves won and lost, kept her appeal close to the ground.